(20288.92.81.313, Chickasaw Council House Museum Collection, OHS). Born to Benjamin E. and Tennie Worsham Mobley on December 4, 1906, and raised near Ardmore, Oklahoma, Tessie Mobley studied piano as a child and transitioned into voice lessons as well. A Chickasaw who grew up on a farm, she learned to break horses and to shoot a rifle. Studying at the University of Oklahoma, she occupied the top position on the Women's Rifle Team. She continued to study piano and opera at the University of Georgia and at Christian Female College at Columbia, Missouri. In 1926 she married an Osage actor, Louis Brave, but they divorced in 1931. Composer Charles Wakefield Cadman discovered Mobley's talent and launched her career as a soloist in 1929 in the Indian Ceremonials at the Hollywood Bowl. The term "Lushanya," meaning "songbird," became attached to her name, and she was often called "the Songbird of the Chickasaws." During the early 1930s she studied at the State Academy of Music in Berlin, Germany. In 1936 she sang at the Democratic Party National Convention in Philadelphia. She also performed soloist roles during the 1930s in Los Angeles and Chicago. 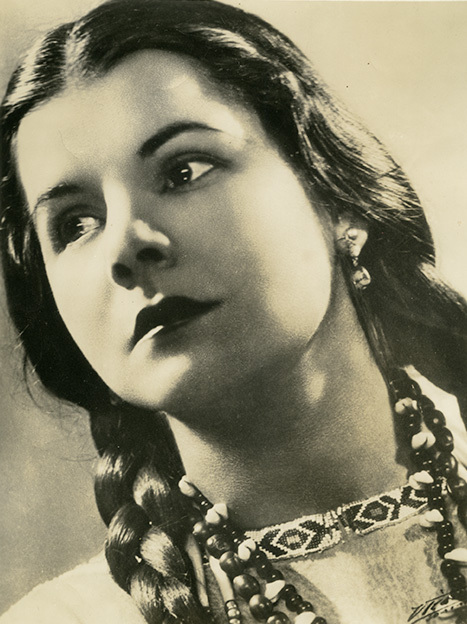 Her most famous solo performance, in the title role of Verdi's Aida, took place in 1937 with the Chicago Opera Company at the Trieste Opera House in Italy. She was the first American Indian woman to perform this role. Mobley toured with other musicians sent overseas to entertain United States troops during World War II. Not only her talent but her beauty was also admired. Charles Wakefield Cadman's opera The Robin Woman became her signature piece. Several European and American artists painted her portrait, one of which was exhibited in the Royal Academy of London. She was presented to King George VI and Queen Elizabeth of England and sang at his coronation in 1937. Later Mobley met the royalty of Sweden and Holland. She married Ramon Vinay, a Chilean opera singer, and retired to manage his career. The couple lived in France, Spain, and the United States. Tessie Mobley was inducted into the Oklahoma Hall of Fame in 1964 and was posthumously inducted into the Chickasaw Nation Hall of Fame in 2009. She died in Fort Worth, Texas, on December 19, 1990, and is buried in Ardmore. Glenda Galvan, "Lushanya/Tessie Mobley, 1906–1947," The Journal of Chickasaw History 6 (Number 3) 2000. "Lushanya (Tessie Mobley)," The WPA Guide to Oklahoma: The Sooner State (Federal Writers Project; Norman: University of Oklahoma Press, 1947). "Sooners at Home and Abroad: Washington Alumni Honor Bizzells; Opera Debut," Sooner Magazine 12 (December 1939). "Tessie Mobley," Vertical File, Research Division, Oklahoma Historical Society, Oklahoma City. Linda W. Reese, "Mobley, Tessie," The Encyclopedia of Oklahoma History and Culture, https://www.okhistory.org/publications/enc/entry.php?entry=MO035.